Friday the 13th – Are You Superstitious? 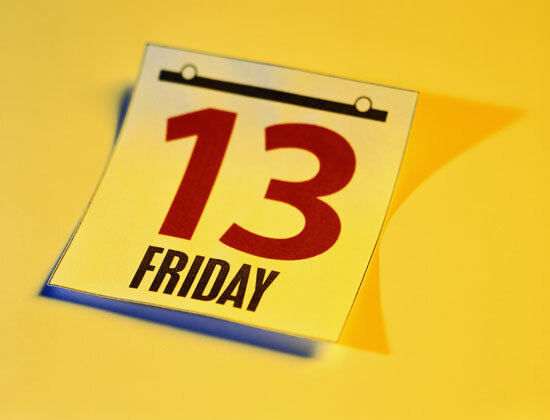 » Friday the 13th – Are You Superstitious? Today is the first Friday the 13th of 2012. This is a date that has come to be synonymous with bad luck. Are you a superstitious person? Will you be calling in sick from school or work today to avoid being outside where a stray piano might fall down upon your head? Life magazine has a neat photo slideshow of Chicago’s Anti-Superstition Society’s Friday the Thirteenth party from 1940 wherein participants tempt the fates by engaging in act after act of superstition. From the breaking of mirrors, to ambling beneath ladders, lighting 3 cigarettes with a single match and cozying up to a black puddy tat, these non-believers are reveling in their disregard for the consequences. All in all, a pretty interesting photo spread and one worth viewing. Just make sure you knock on wood, toss some salt over your right shoulder and wear a garland of garlic to hedge against unpleasant consequences! Do you have any superstitions? Tell us about them in the comments.